When you get the yen to slow things down and leave the interstate behind, America’s two-lane highways can lead to some pretty amazing places. US89 traverses the Western US from northern Montana to Flagstaff, AZ, with the chance to visit six of our country’s national parks along the way. Ready to find out why US89 is on many an RV traveler’s ‘got-to-drive-it’ list? Let’s start our journey at the highway’s northern US terminus—Piegan, Montana. You’ll be skimming along the eastern side of Glacier National Park, so don’t miss the chance to experience the Northern Rockies by camping in Glacier NP and hiking at least one of the park’s seven hundred miles of trails. There’s nothing quite like topping a rise to be greeted by the sight of a glacial lake! Bonus Glacier National Park RV travel tip: if you’re coming from the Pacific Northwest, swing through Seattle to pick up your RV rental as you come. Let’s keep moving! Quaint mountain towns like White Sulphur Springs, MT will keep things interesting as you make your way south on US89 to Wyoming and the wonders of Yellowstone National Park. On the way, you’ll have passed through Lewis and Clark National Forest, another natural treasure worth spending time getting to know. Once US89 reaches Yellowstone at Gardiner, follow the Grand Loop Road south through Mammoth to Old Faithful (not clearly marked as US89 within the park). Take the time to visit as many of the national park’s scenic wonders as you can, including Old Faithful, Mammoth Hot Springs and Grand Canyon of the Yellowstone. Camping in Yellowstone is also a ‘don’t miss’, so make your reservations before you come. Get ready for the jaw-dropping splendor of the Teton Range as you follow US89 (marked as John D Rockefeller, JR Memorial Parkway) from Yellowstone’s southern border into Grand Teton National Park. The rugged beauty of this national park will lure you to hike one more trail, take one more photo and wonder why it took you so long to visit. Whether you prefer ‘dry camping’ in the forest or a full-hookups site at the foot of a mountain, there’s the perfect place to come RV camping in Grand Teton NP. When you’re ready to roll south again, the scenic route continues to the famed mountain resort town of Jackson, WY, continuing along the spectacular Grand Canyon of the Snake River and through Star Valley, surrounded the entire time by national forests. You’ll cross over into Idaho and then swing south toward the bright blue waters of Bear Lake at the Utah border. If you’re ready to stop for the night, numerous campgrounds in the Bear Lake State Park area will be right along your route. Keep following US89 south from Bear Lake as it becomes Logan Canyon National Scenic Byway and then south through iconic Utah towns like Brigham City and Ogden on your way to Salt Lake City. The Wasatch Range, Temple Square, the Great Salt Lake and Wasatch-Cache National Forest offer RV travelers along US89 in Utah plenty of places to stop and explore. And then it’s south again along the Jordan River, through valley towns where Utah’s Mormon heritage is celebrated and the cool, green beauty of Manti-La Sal National Forest. Palisade State Park’s RV campsites come highly recommended, if you need a place to stop just off the highway. From Palisade State Park to Utah’s southern border, your RV trip along US89 will be, in a word, “breathtaking.” Utah’s southern National Parks are unlike any other region in the country. Take the quick side trip east to Bryce Canyon National Park to photograph red rock hoodoos and spires and hike a canyon trail. Spend the night in one of this park’s inexpensive campsites before swinging back west to US89 and Zion National Park. The canyon trails, waterways and multi-colored vistas that bring visitors to Zion National Park will encourage US89 travelers to stay awhile. Whether it’s a scenic drive through Kolob Canyons or a hike through The Narrows, there’s a way for everyone to experience the wonders of Zion. Campgrounds fill early in warm weather, so plan to arrive in the morning. We’ve saved the best, or at least, the best-known, stop along US89 for last. Grand Canyon National Park north of Flagstaff, Arizona is the final stop on this itinerary. But before we reach the ‘big one’, enjoy the trip as US89 swings east through the magnificent cliffs and canyons of Grand Staircase-Escalante National Monument to cross Glen Canyon Dam at Lake Powell/Glen Canyon National Recreation Area. Your camera will be clicking as the blue waters of Lake Powell contrast with surrounding red rock formations for one-of-a-kind vistas. Once you’ve made your way to the Grand Canyon, choose your favorite campground and set up camp, then let the convenient shuttle service transport you to the national park’s most famous attractions. From Yavapai Point to the Skywalk, there are trails, scenic overlooks and photo opportunities enough for a lifetime of exploration. Ready to find your own treasured travel memories on US89? There’s no better way to experience the American West than with an RV camping trip from point to point, national park to national park, on this iconic roadway. You can even explore further south along the ‘traditional route’ of US89 all the way to Nogales, Mexico! No matter where you choose to travel on US Route 89, there’s an RV rental nearby, so don’t let lack of a motorhome slow you down. It’s an epic journey and one every adventurous RV traveler should embark upon at least once. Let us know about your US89 adventures! Ready for a place to park your RV with abundant outdoor adventure close at hand? Cedar City, Utah, about halfway between Las Vegas and Salt Lake City, is ground zero for outdoor recreation. Why so much back-to-nature fun near Cedar City? Southwest Utah and its amazing variety of national parks and forests is all within an easy drive from your Cedar City RV campground. Come along as we do a quick tour of the outdoor wonderlands you’ll want to visit. No motorhome trip to Cedar City and Southern Utah is complete without a visit to Zion National Park. Home to awe-inspiring redrock cliffs and canyons, Zion is just fifty miles south of Cedar City. Once you’re there, your outdoor fun can take the shape of wading the Narrows Trail down the Virgin River, hiking, biking or driving the scenic wonders of the Kolob Canyons or making it your mission to discover the Park’s outstanding waterfalls. No matter what kind of recreation gets you out into nature, you’ll come back to your campground filled with tales to share. Get ready to be blown away by the raw beauty of this half-mile deep, three mile wide amphitheater in the mountains thirty minutes east of Cedar City. You’ll climb to ten thousand feet and then watch as the earth drops away in spectacular fashion at the rim of this remarkable formation. Bold hoodoos and spires can be spotted on the canyon floor and the entire Cedar Breaks formation is one glorious vacation photo in the making. Ways to get outdoors and explore? Pack gear for rain and sudden drops in temperature and then explore one of the Monument’s trails. Whether you’re up for the high altitude, challenging Spectra Point Trail or choose to explore the forests, flower-filled meadows and ancient rock formation along the Alpine Pond Trail, have your camera ready. It’s going to be memorable! Campers who desire an authentic wilderness experience will find it just a half-hour drive from Cedar City. Dixie National Forest, two million acres of red rock and limestone canyons, high desert plateaus and dramatic mountain gorges, can be as remote and isolated an adventure as you choose. Four wilderness areas—Ashdown Gorge, Box-Death Hollow, Cottonwood Forest and Pine Valley Mountain—each hold mystery and beauty that only travelers willing to take the challenge will discover. Even a short hike along one of the marked trails will give you a sense of America as it appeared to its earliest inhabitants. Don’t miss it! One more wondrous spot outdoor adventurers will want to visit on an RV camping trip to Cedar City is Bryce Canyon National Park. Located eighty miles east across the southern end of Dixie National Forest, Bryce Canyon defies accurate description, with countless limestone hoodoos, scenic overlooks and pine forests that seem to grow from bare rock everywhere you look. Hiking a canyon trail or looking out over miles of baffling limestone formations will inspire awe and create wonderful vacation memories. RV Travel Tip: RV parking outside the campgrounds at Bryce is limited to overflow lots, so plan to take your towed vehicle from Cedar City or take advantage of the free shuttle that stops at RV parking areas. It will take you to all major attractions within the park with hop-on, hop-off privileges. A bonus tip for outdoor adventurers coming to Cedar City: the mountain biking here is outrageous! Use this guide to Cedar City/Brian Head mountain biking trails to plan your own two-wheeled trek through some of the prettiest terrain ever. Before we go, have we mentioned that Cedar City’s cooler temps, thanks to its five thousand feet elevation, make it the perfect summer RV getaway? When you come back to your campground, take the time to visit Cedar City’s own historic and cultural attractions, including a nationally famous Shakespeare Festival held all summer long! Summer’s the time to visit Cedar City by RV, when mountain roads are clear to millions of acres of national parks and forests. Come for top-notch Utah RV camping and discover the center of outdoor fun. You haven’t seen true natural beauty until you’ve seen the arches and canyons of the American Southwest! Years of erosion from wind and water have shaped the terrain of Utah into soft, flowing valleys and towering spires of rock. Utah’s arches and canyons should be on your “must visit” vacation list, and you’ll need several days to take in every amazing sight. In order to do this vacation right, pick up an El Monte RV in Salt Lake City or get an RV rental from a location closer to your home from one of the other numerous El Monte RV rental locations found throughout the U.S. and then get ready for the expedition of a lifetime! Your first destination should be Dead Horse Point State Park. Despite its name, the park is anything but dead! The most famous feature of the park is the view from the top of a 2,000 foot prominence above a “gooseneck curve” in the Colorado River. Over the millennia, the river has carved its way deep into the rock of the park, leaving layer after layer of fantastic, multi-colored rock. The sight of the river’s slow and steady meandering journey through the landscape will take your breath away. A short drive away you’ll find Arches National Park. The name may be simple, but there’s a reason this is a world-famous destination for lovers of the great outdoors. You have to see the natural arches to believe them. The graceful arcs of stone look like they shouldn’t be able to stand on their own. The longest, Landscape Arch, is an incredible 306 feet long! After you’ve finished snapping pictures, take some time to sit back and simply enjoy the view! If you’re ready to find an even more hands-on approach towards examining the arches, check out the Moab Adventure Center to sign up for some rock climbing and canyoneering. At the Adventure Center, expert guides will help you suit up and scramble over hundreds of feet of red rock. You can even rappel down into chasms or off a giant arch! After getting up close and personal, the next best way to see the parks is from up high. The best way to do that is by way of a hot air balloon! Canyonlands Ballooning will take your group up, up and away over Moab, Utah, and all of the incredible surrounding countryside. The expansive view of the landscape can’t really be comprehended until you take it all in slowly from the sky. Another view you can’t get anywhere else isn’t just from the sky – it’s of the sky itself. Far from bright city lights, take your RV out at night to meet up with Redrock Astronomy. After arriving at a designated “dark sky site,” Redrock Astronomy will regale you with tales of how early Native Americans understood the universe and their relation to the stars. You’ll get to examine those stars through a high-powered telescope and see them with a level of clarity that’s impossible to attain near towns and cities. The arches and canyons of Utah are like a whole different world. Pick up an El Monte RV motor home today and you can head out on an expedition you’ll remember for your entire life! Remember to plan ahead and reserve your camp site inside the Arches National Park HERE! For information on locating other RV campground locations CLICK HERE. 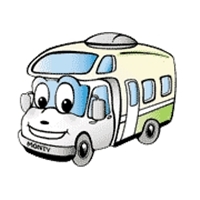 For information on renting a motor home CLICK HERE!